Our goal is to unravel the mechanisms of wake and associated pathologies: narcolepsy, excessive daytime sleepiness, insomnia, metabolic disorders, sudden infant death syndrome. From a basic research standpoint, we dissect the mechanisms of wake through the study of the specific, complementary and synergistic roles of histaminergic and orexinergic neurons in particular. Using specific knock out mice and detailed behavioral and electroencephalographic measures, we will determine how the two systems interact synergistically and integrate into the central mechanisms of sleep-wake alteration (JS Lin, K Sakai). We also use intracellular recordings, local field potentials and biosensors to study the properties of the cortical network during different types of behavioral states, the respective role of diffuse ascending systems and specific cerebral nuclei, and the mechanisms and effects of extra-synaptic variations of neurotransmitter (S. Crochet, S Marinesco). From a physio-pathological and translational research standpoint, we work on 1) developing therapeutic approaches for narcolepsy and excessive daytime sleepiness using our knowledge of histaminergic and orexinergic systems (P Franco, JS Lin), 2) investigating the interactions between sleep loss and metabolic disorders in lean subjects and obese patients and in animal models combining sleep/wake and metabolic alterations (K. Spiegel), and 3) identifying new signaling pathways and biomarkers associated with wake thanks to Drosophila molecular genetics (L. Seugnet). 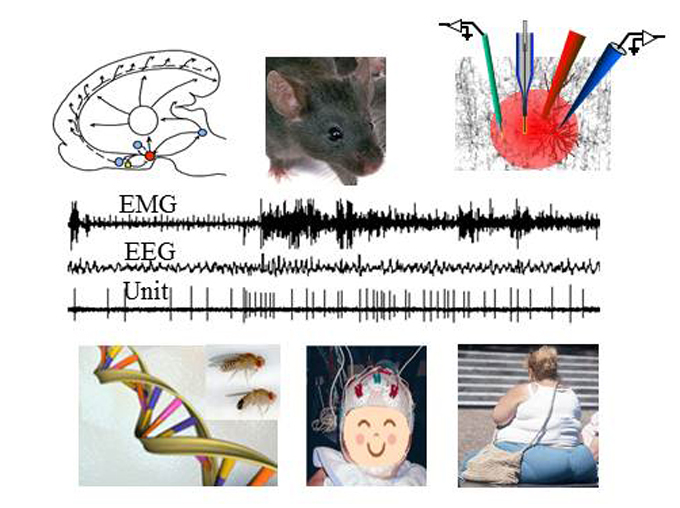 Our work is thus characterized by the use multidisciplinary methodological approaches: electrophysiology and behavior, biosensors, clinical investigations, molecular genetics, and the development of tools for both diagnostic and therapy. Please click on individual names in the list below for more information. Dernière modification le Lundi 15 Mai 2017 à 13:54:45.